The Windsor Volunteer Fire Company, which will celebrate its 100th anniversary September 4, 5 and 6, has behind it 100 years of faithful and diligent service to the town. The old papers recently uncovered show that the company was formed on the day of September 6th, 1830. The first entry reading: "This company was formed by subscription, September, 1830, on the condition that each member should pay the sum of five dollars, the money to be refunded in the case of failure of the project." The project was not a failure and 100 years have gone to prove the foresight of the men who founded the company. The men subscribing five dollars each and thereby becoming charter members of the company were men who were leaders in the town. Twenty names are found as the first to enlist: H. B. Loomis, F. A. Drake, Edward Chandler, G. Sheldon, A. Bower, S. O. Loomis, E. Smith, W. Shelton, S. W. Ellsworth, A. Moffitt, E. Loomis, N. H. Barber, B. D. Tustin, S. P. Moore, D. D. Rowland, H. H. Filley, J. Baker, H. Druston, B. B. Woodford and A. M. Bilbourn. Many of the families represented by these men are still prominent in the town affairs. From the above group the first officers were chosen: Warden H. B. Loomis, Deputy Warden F. A. Drake, Secretary Erastuc Smith and Treasurer Edward Chandler. Shortly after the forming of the company a charter was obtained from the State Legislature granting the company the right to incorporate under the laws of the state and to impose fines upon members, not to exceed $5, for failure to comply with the by-laws of the company, provided that the laws of the state. Power was also granted to impose taxes upon the members for the building of an engine house and purchasing of apparatus. The charter exempted members from the poll tax. The company fixed a fine of fifty cents for a member failing to attend a meeting. The charter was signed by Thomas Day, who was then Secretary of State. After the granting of the charter the company was protected from the ravages of rival companies who might want to start a company of their own. This feeling of security led to the soliciting of funds in order to erect a fire building and also for the purchasing of apparatus. Members subscribed generously and many townspeople gave their time and money. A few of the villagers, however, thought that fire protection was useless, saying that a "squirt gun" would be as satisfactory as a pumper. In 1832, however, money was raised to insure the erection of a building. The same year the building was raised for the housing of a hand pumping engine and hose cart. The building lasted until 1869. In 1869 a disastrous blow was dealt the company. It came in the form of a fire, that not only destroyed the fire building and equipment, but burned twelve more large buildings in the center of Windsor. The fire house and apparatus was one of the first to burn. The hotel, which stood near the site of the present Town Hall, and buildings in the vicinity of the present home of Dr. Aaron P. Pratt, were demolished. The Hartford Fire Company came to the rescue with one piece of apparatus from that city, pulled by four horses. The Hartford Company was instrumental in subduing the blaze. The conflagration was a severe setback to the Windsor Company and for several years they answered call with only a bucket brigade. The citizens were wary of subscribing for another piece of apparatus. The company held together throughout the turbulent years, and after hard work again regained prominence in the well keeping of the town. The early history of the company includes some delightful social events, in which the entire town took part. The meetings of the company were held in one of the several hotels of which the town boasted at the time. The meeting was generally adjourned when the company was gathered, and a fine dinner was served before the work of the meeting. An annual ball was given on each Thanksgiving Day. Old and young attended, and feasts that only Washington Irving could describe were cooked and eaten. Dancing went on all night, and it was in the early hours of the morning that the party ended. Then it was a long ride home behind the bay team, with frost nipping one's nose, and the younger members of the party already asleep. These events always proved enjoyable, and it was through such events that the town was brought to greater unity. Ellsworth N. Phelps, who resided on the Island in the old Ellsworth home, now owned by the Loomis Institute. After his return from the war the colonel engaged in the tobacco business, operating a warehouse on the ground where the Tunxis Theater now stands. His place of business was destroyed by fire on June 7, 1868. The Fire Company during the years of war and the poverty-laden years that followed, rapidly deteriorated, and calls for fires were answered only spasmodically. Thing went in this manner for nearly twenty years. Then came the re-organization of the company. This important move was instigated by the late Judge H. Sidney, one of the prominent citizens of the town. With the help of Daniel W. Mack, Now the oldest living ex-chief of the Windsor Fire Company, a meeting was called for the re-organization of the Windsor Fire Company. The meeting, presided over by the late Deacon J. B. Woodford, was a success and enthusiasm for a new engine and building was aroused. Shortly after Judge Hayden gave notice that he would provide a building to house it in. This was a fine chance to re-establish the company but the records show that the generous offer was not accepted. The housing plan was hard to comply with. Judge Hayden then reversed his offer, stating that he would give the house if the townspeople would furnish the equipment. This plan was met with enthusiasm. The funds for new apparatus were faster in reaching a satisfactory total than the work of furnishing the building. The structure was erected at the rear and north of the Town Hall, and is still owned by the Fire Company. The Judge not only erected the building, and put the company on its feet, but gave generously to the funds for the purchasing of the apparatus. Although the building no longer houses the engines, it is still used for the storage of spare equipment, a fitting memorial to the public-spirited men of several decades ago. A special meeting of the re-organized company was held in the new meeting house on April 28, 1880, and Daniel W. Mack was chosen warden of the company. Warden Mack's Associates were: Deputy Warden Daniel Phelphs, Secretary F. M. Charter, Treasurer Joseph Baker. The by-laws of the original company were adopted and the new company composed of the officers and Hiram Cobbs, J. L. Clark, Colonel Ellsworth N. Phelps, George H. Fitch, William H. Filley, J. C. Ransom, Charles H. McManamon, Wallace G. Wrisley, Harace A. Daniels, Henry C. Mack, Willaim R. Mack and William Ware. The members of the re-organized company have now passed on, with the exception of Warden Mack. The re-organization meeting was adjourned April 28, 1880 and was continued May 7 of the same year. At the continuance of the meeting many others were taken into the company, so that the new Windsor Fire Company soon numbered twenty-nine. The members enrolled May 7 were: Ernest A. Godard, Dwight T. Phelps, Edson A. Welch, John Higinbotham, Fred W. Marks, William H. Teft, J. Albert Goddard, Fred W. Mack, Horace Holden, Jr., Beamon Shannon and Martin Palmer. All of these men are dead except Ernest Goddard, who resides in Bridgeport, and his brother, J. Albert Godard, who resides in Windsor. The equipment at this time consisted of one old hand pumping engine. This served the for thirty-five years, and before it was a acquired by the local company it was used for thirty-four years in Woburn, Mass. It was made in Middletown by the Douglas Pump Company in 1846, and was re-conditioned at the factory before coming to Windsor. This engine was dragged by the firefighters many miles over the country roads to a fire, and when the destination was reached it had to be worked by hand. The pumper is still in good condition and may still be used in cases of emergency. It is a fine example of Yankee ingenuity and thoroughness. Once a month during the summer months the pumper deluged the Windsor Green. Contests, to test the endurance of the firemen, were held with the Poquonock Company, which has since passed into oblivion. As the story goes, the Windsor men were badly out-classed. 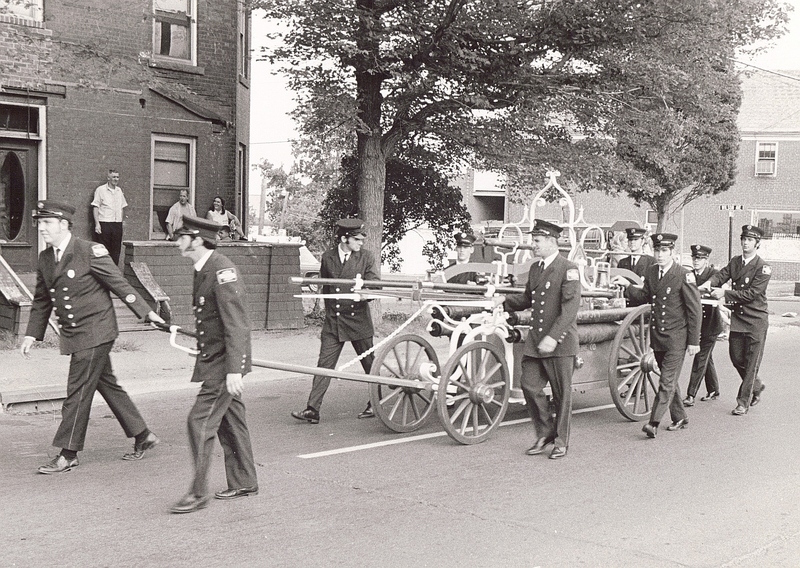 Warden Mack served faithfully in the capacity of head of the Windsor Fire Company for more than three years. He retired in 1883, for business reasons. He had, however, set the Fire Company on a firm basis, which has continued to the present day. He was still vitally interested in the company and helped in many ways. The company did come near to disaster in 1894, when a fire broke out in a meat market and barber shop where the rear part of the Murphy building now stands. The company lost the battle and had to work the pumper hard to save their own building. The building was saved and the company was also saved. As the years progressed the members of the fire company, as well as the people of the town, which was rapidly becoming a suburb of Hartford, were awakened to the needs of better fire protection. 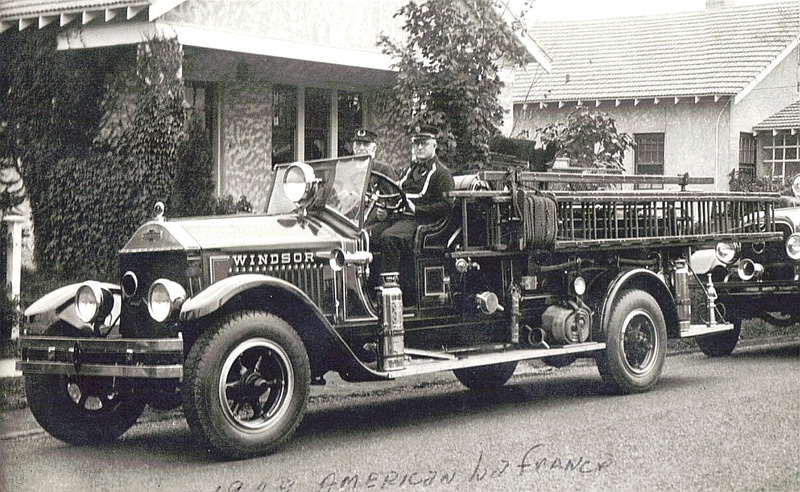 Windsor, then, become one of the first volunteer fire departments to boast a chemical fire engine. Word was received from the Providence Fire Department that they had for sale one horse-drawn 70-gallon fire engine. 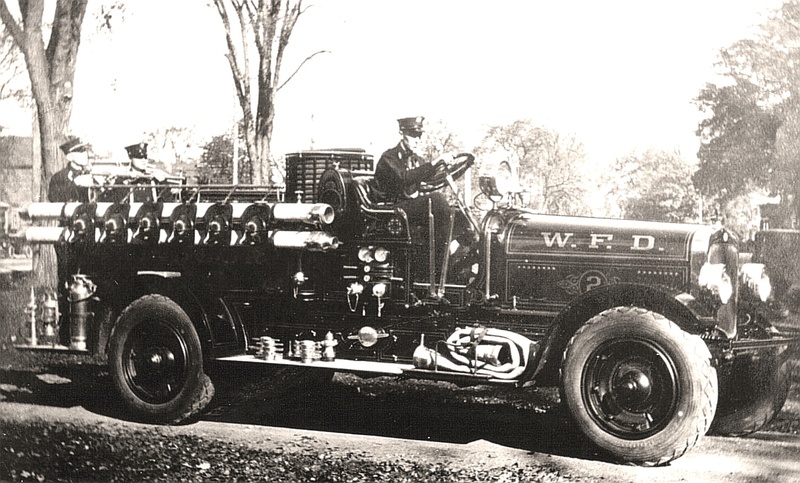 A committee composed of the late Owen E Goslee, who was assistant chief for many years, the late Albert E. Phelps, and Fred H. Tolles, were sent to Providence and purchase the engine for the company. The new chemical, which was delivered in 1902, was a prominent part of the equipment and was used in conjunction with the hand pumper. It was kept in commission until 1918. Then came the death of Judge Hayden, and the refusal of the town to pay the rental of the town to pay the rental on the hydrants which had been installed in the central part of the town. The hydrants had been installed by the Windsor Water Company, which had been started by Judge Hayden. After the refusal of the town to pay the rental the hydrants were removed and the firemen relied for some time upon the wells and streams for their supply of water. The Windsor Sewer District was changed to the Windsor Fire District and the Fire District then bought the Windsor Water Company. The hydrants were again installed, many more being distributed in important places. However, it was becoming more apparent that Windsor had need of better protection, but the men realized that the purchasing of a modern motor driven engine was too large an undertaking for the Volunteer Company. 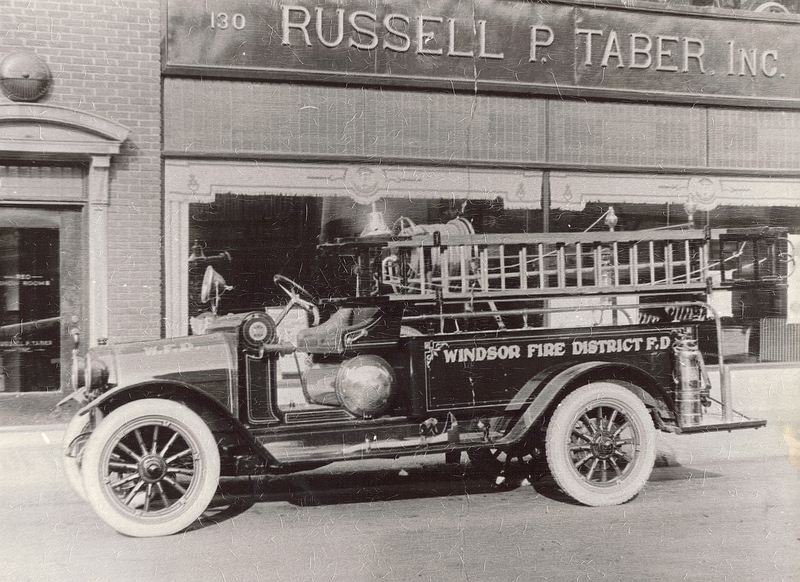 A petition to the town in 1917 for a motor driven truck was turned down, as the Windsor Fire Company was not in any way connected with the town business, and their charter would not permit the taxing of the townspeople. Conferences were held with the District Commission with the result that the members of the Windsor Fire Company enlisted as members of the Windsor Fire District Fire Department. The equipment was turned over to the District, and the District in turn bought a motor-driven fire truck. The truck was delivered in November, 1918, being driven all the way from at Utica, N.Y. A delay of several days was made due to the fact that the truck reached the City of Albany as the people were celebrating the Armistice; men and boys caught hold of the truck with the results that it was badly scratched and had to be repainted before being delivered. The truck served the town for several years and is still in use within the district. The need for another engine was apparent, and the old engine was given to Poquonock Fire Company. The town then bought a new engine with chemical tanks and a 750-gallon per minute pumper was bought. The greatest need for protection was outside the fire district, and after considerable discussion the town purchased a modern pumper with a capacity of 500 gallons per minute. The town then made arrangements with the District to have the engine manned by the Windsor Fire Company and also have the engine housed in the fire house. This arrangement has proved very satisfactory. The company is now housed in the fine building on Union Street, in Windsor. It also has the old building in the rear of the Town Hall where spare pieces of apparatus are stored. It has two modern trucks, one though larger but older truck to operate within the district and the new LaFrance to operate within the limits of the town. The Windsor Fire Company has been helpful in starting the two newer fire companies located in Wilson and Poquonock. The Poquonock Company is the newer, although Poquonock boasted of a fire company years ago. The old company, however, passed away, and the new company was started two years ago. The Wilson Company, which is now taking possession of its new fire house on Windsor Avenue, has been helped considerably during its struggle to gain confidence of the town by the Windsor Company. Several old pieces of apparatus have been given to both companies.